Scott Arnold secured his first Australasian tour victory with a one stroke win over Kurt Barnes at the Victorian Open at Spring Valley. Arnold finished at 12-under-par after rounds of 71-66-67-68. First round leader Michael Hendry from New Zealand finished in third position at 7-under-par, with Peter Lonard, Leigh McKechnie, Matthew Ballard and Nick Cullen in a tie for fourth at 5-under-par. The Victorian Open title is an important victory for 26-year-old Arnold. The win was not only timely, but is a major confidence booster for the UK-based Arnold. With plans to play several OneAsia Tour events towards the end of this month before returning to the UK, Arnold heads to these events with newfound confidence. “My first reaction was one of relief,” said Arnold who before the tournament called on the watchful eye of legendary coach Alex Mercer to fine tune his game for the tournament. It was not until the final hole at Spring Valley where this Victorian Open was determined after Kurt Barnes did another trade-mark late run for a title with a closing 5-under-par, 66, final round, the day’s low round. Arnold and Barnes had traded shots in challenging conditions dished up with strong south westerly winds. “Towards the end it was a three club wind,” said Arnold. Arnold had hailed from an impressive amateur background and since turning professional in 2009 has focused his game in Europe. 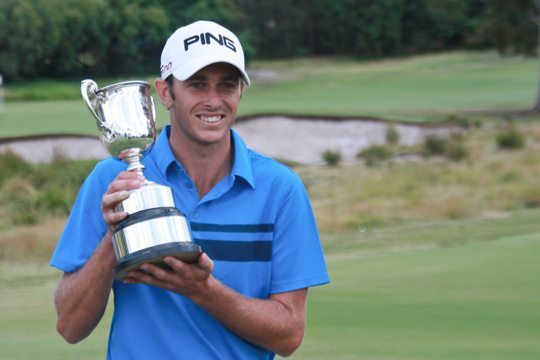 A three-time winner on the main Australian Amateur circuit, Arnold claimed the 2009 Lake Macquarie Amateur, the 2008 Riversdale Cup and capped off his amateur career winning the 2009 Australian Amateur title. The formative years on the professional circuit have proved challenging for the former world number one ranked amateur. Arnold is part of the Chubby Chandler group of players in the UK developing their game on the challenging European golf circuit. At present Arnold is looking at five to eight starts in Europe and will focus on the Challenge Tour this season in an effort to progress to the main European Tour. Europe has not damaged Arnold’s development as a player, as recent performances upon his return to Australia illustrate. In 2009 at the NSW PGA Championship at Wollongong Golf Club Arnold finished runner-up to Aaron Townsend. A week earlier Arnold nailed a final round 65 at The Vintage in horrendous conditions when the majority of the field failed to break par, giving him a third place at the NSW Open. “It’s such a relief to finally get this win,” said Arnold.